This symbol of the White Stag has been cropping up for me again lately, and is one that has been with me a long time, so thought I would do a post on it. It is not specially about Deer as symbol, which is somewhat different (though related) and I will do a different post on that symbol (some time). the Cosmic Child resting full of trust against The White Deer summed up many subconscious or unconscious things for me, and I instantly was drawn to it. So, in this sense exploring its meaning is interesting for me. 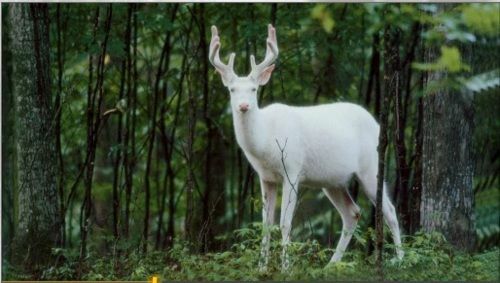 Deer, but White Deer in specific, have been considered by Celtic people to be messengers from the Otherworld. Cernunnos, the horned god, is associated with stags. “The Horned One” is a Celtic god of fertility, life, animals, wealth, and the underworld. He was worshipped all over Gaul, and his cult spread into Britain as well. Cernunnos is depicted with the antlers of a stag, sometimes carries a purse filled with coin. The Horned God is born at the winter solstice, marries the goddess at Beltane, and dies at the summer solstice. He alternates with the goddess of the moon in ruling over life and death, continuing the cycle of death, rebirth and reincarnation.Paleolithic cave paintings found in France that depict a stag standing upright or a man dressed in stag costume seem to indicate that Cernunnos’ origins date to those times. Romans sometimes portrayed him with three cranes flying above his head. Known to the Druids as Hu Gadarn. God of the underworld and astral planes. The consort of the great goddess. He was often depicted holding a bag of money, or accompanied by a ram-headed serpent and a stag. Most notably is the famous Gundestrup cauldron discovered in Denmark. The White Stag is often associated with the Unicorn, although I’m sure there have been many more sightings of the Stag. 🙂 Because the whiteness came from a medical condition it would have been rare and therefore have felt unusual for hunters who saw the White Stag. This would naturally have created traditions of taboo around harming it. I have met a stag in a forest once, an ordinary one, huge, full-antlered, and it is an awesome sight. Your breath just naturally becomes completely still and time feels dream-like. This animal at peace moves very differently than the kinds of movements modern human is used to ~ it is stately and slow and deliberate, absorbed, ethereal. Because the White Stag has been elusive to hunters it has come to represent the Spiritual Quest. It draws the hunter on to ever new places. In King Arthur’s legends he and his men found the magical Pellinore’s Well because they were in pursuit of a White Stag. In the Chronicles of Narnia, Aslan is supposed to have been the White Stag (transfigured) who led the children out of Narnia. He had been the first animal Lucy’s brother had seen there too, drawing the Witches chariot. That White Stag could grant wishes to anyone able to catch them. It is a symbol in almost every culture. It is sometimes said to have the Sun or a Cross between its antlers or on its forehead ~ the White Stag has been considered a symbol of Christ. It is said that Christ appeared to the Roman soldier Eustace in the form of a White Stag. Lord of the forest, masculine power of regeneration, giver of bounty, beauty and mystical signs, fights when cornered but prefers to run away. The antlers of the stag have long been a symbol of worship and are associated directly with the fertility of the God. The pagan Horned God in his many incarnations, often appears wearing a headdress of antlers or in some depictions, the horns grow directly from his head. In some Pagan paths, there is a correlation between the shape of a pair of horns and the crescent moon. The image of a stag with a full moon between his antlers represents both the male (the antlers) and the female (the Moon) aspects of the Divine. Across the North, since the Neolithic, from the British Isles, Scandinavia, Russia, Siberia, the land bridge of the Bering Straights and into the Americas, the female reindeer was venerated as the ‘life-giving mother’. She was the facilitator of fertility, the anima of wild places, forests and mountains, the otherworldly steed of fairies and magical folk. Her horns adorned altars and the heads of shamanic priestesses and her image was etched in standing stones, woven into ceremonial cloth and clothing, cast in jewelry and painted on drums. 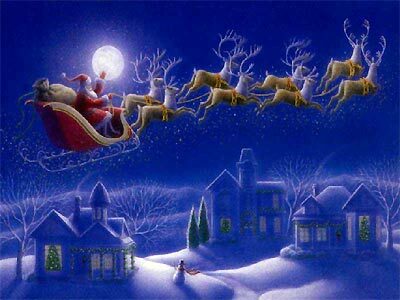 Rarely depicted running on land, the reindeer was seen leaping or flying through the air with neck outstretched and legs flung out fore and aft. Often carrying the cosmos, the sun, moon and stars in her horns, her antlers were the tree of life, depicting the lower, middle and upper worlds. The Deer Mother has also been visualized as a seated woman/goddess, wearing a horned headdress into which is woven the tree of life and the bird (emblematic of shamanic flight). This trio of symbols is often repeated in winter solstice imagery and Christmas folk art and is still with us – though we have clearly forgotten their original meaning. 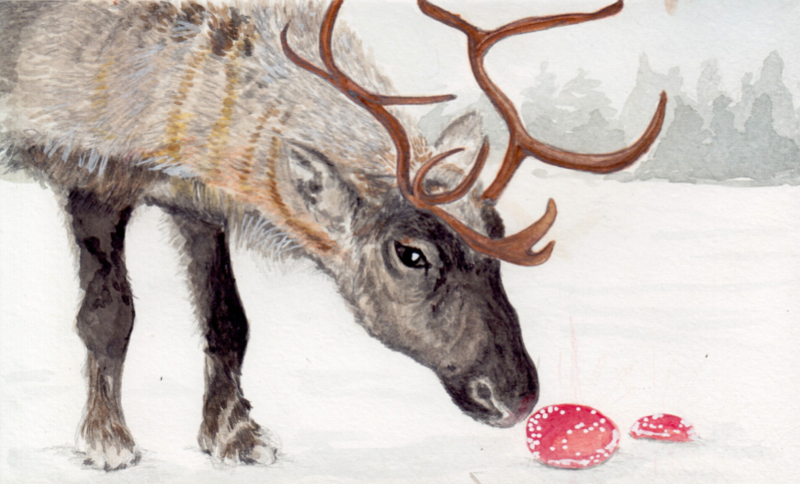 In Siberian legends the reindeer took flight each winter after ingesting the hallucinogenic Amanita Muscaria mushroom, the archetypal red toadstool with white spots. Shamans would join them on a vision quest, by taking the mushrooms themselves and then, climbing the tree of life they would take flight like a bird into other realms. 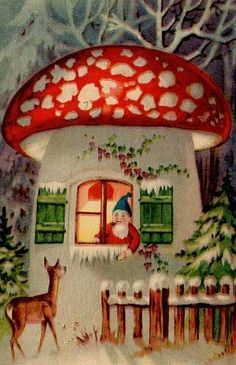 There are theories that Santa’s costume derives from shamans in the Arctic regions who would dress in red suits with white spots, collect the mushrooms and then deliver them through chimneys as gifts on the winter solstice. Talk about a wild night. In Siberia, female shamans wore red and white costumes trimmed with fur, horned headdresses (or felt red hats!) and practiced the tradition of shamanic flight. And most likely it is their winter solstice celebration of the deer mother, that brought us the stories of flying horned reindeer who take to the sky on the longest night of the year. Rozhanitsa was an antlered winter goddess of the Ukraine and on her feast day (during winter solstice) red and white embroidery depicting her were displayed and small white cookies shaped like deer were given as good luck tokens. At on winter solstice (or just thereafter) Saule, the Lithuanian and Latvian goddess of light and the sun, flew across the heavens in a sleigh pulled by horned reindeer and threw pebbles of amber (symbolizing the sun) into chimneys. So this solstice remember to look out from your warm cozy home into the cold of the darkening eve. Remember the forgotten winter goddesses of old and their magical reindeer. And on the sacred night when the sun is reborn, look for Mother Christmas waiting silently as a deer in the temple of nature, carrying a bird in her horns. And the second part of the article now…which is longer, but also interesting… Danielle Prohom Olson continues…. Right now the internet is awash with posts and articles examining the pagan and shamanic origins of Christmas. Much of the material emphasizes the masculine, i.e. investigating the pagan sources for Father Christmas. But what seems to be overlooked is the idea that there may have been a “Mother Christmas’ and a feminine source for yule traditions. Who were these “Mothers”? And why were they so important to what has become known today as Christmas? Similarly erased from history are the female shamans of the northern peoples who may play an unacknowledged role in much of our modern Christmas iconography. There is a male-centric bias at work in many explorations of the early pagan traditions. There are a plethora of “alternative” articles observing the link between Santa’s red and white garb and the red and white amanita mushroom ingesting Siberian shaman- but they consistently refer to this shaman as “him”. Little mention is made that this red and white ceremonial clothing was worn by the earliest shamans in the northern regions who were -and still are – female. 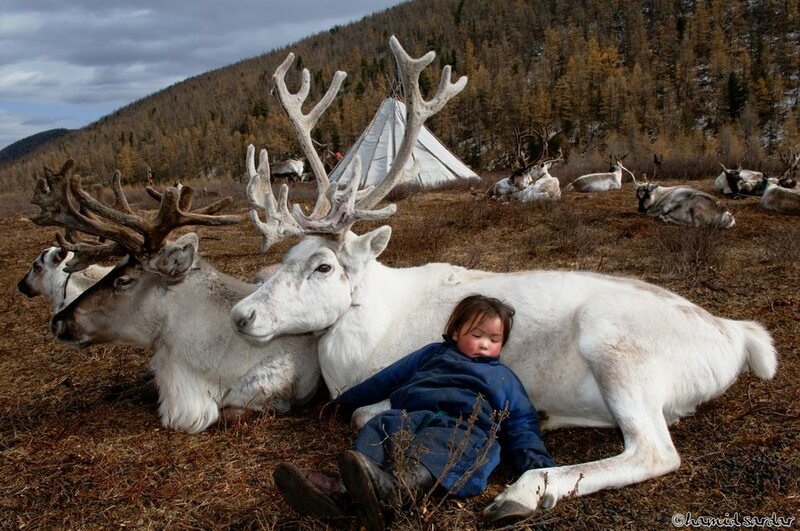 In fact the leader of the Mongolian Reindeer People, according to this source, is a 96-year-old shaman known as Tsuyan. And when it comes to the deer, well there is much talk of the stag, but little mention of what was once an important spiritual figure to our northern ancestors – the Deer Mother. Many ancient “religions” or spiritual belief systems across the ancient world venerated nature – which was often perceived as a female principle or a goddess. That this goddess was often personified as a deer (or reindeer in northern climates) or as female shaman wearing antlers is well documented. Much historical scholarship has assumed that many of these horned images were male, and associated with the stag. But considering the evidence for a reindeer mother goddess cult dating from the prehistoric (when the earth was much colder and reindeer more widespread) many scholars now suggest that some of these images may be women and that the stags may be in fact, female reindeer. 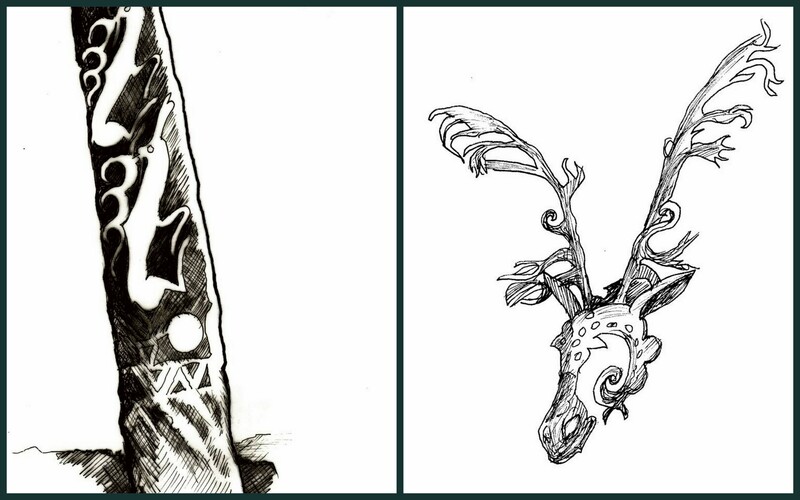 In Miranda Green’s book Symbol and Image in Celtic Religious Art she states, “animal symbolism associated with goddesses reaches it apogee with horned female images, usually adorned with antlers. 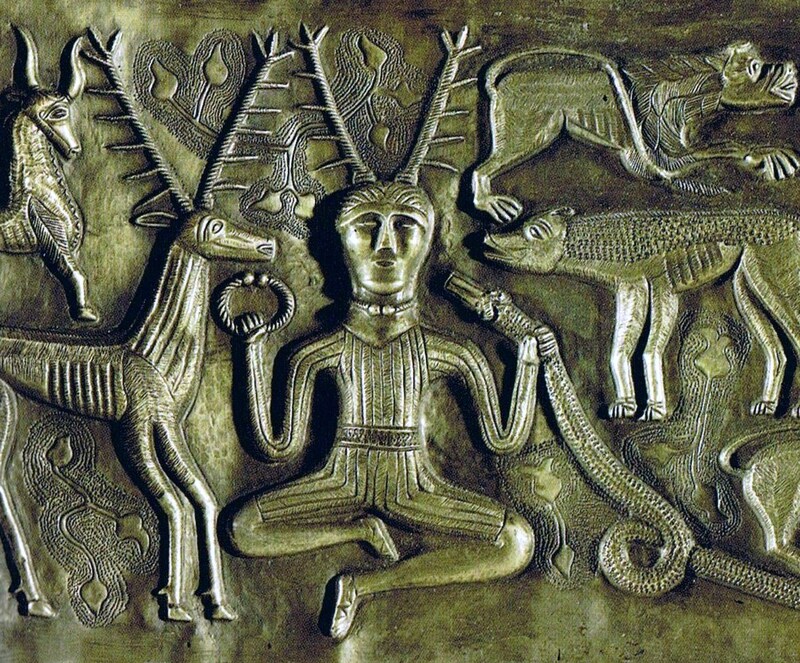 Green makes the point that while the antlered god Cernunnos is well known in eastern Gaul (and is revered in many pagan circles today) there were also feminine counterparts found in at many sites such as Clearmont-Ferrand (Puy de Dome) and at Besancon (Doubs). These bronze antlered goddesses were also depicted sitting crosslegged with symbols of cornucopia” – another well known female associated symbol of fertility – i.e. the “horn” of plenty. Esther Jacobson complied the deer iconography of the early nomads of South Siberia and northern Central Asia. Her book The Deer Goddess Of Ancient Siberia: A Study In The Ecology Of Belief traces the image of the deer from rock carvings, paintings, and monolithic stelae from the Neolithic period down through the early Iron Age. And her study demonstrates that this is primarily a deer goddess “religion “revolving around female wise woman and the deer mother herself, the antlered doe. Mary B. Kelly in her book “Goddess Women Cloth : A World Wide Tradition of Making and Using Ri…” and Goddess Embroideries of Eastern Europe provides an exhaustive, in-depth look at the ritual motifs of ceremonial weavings. 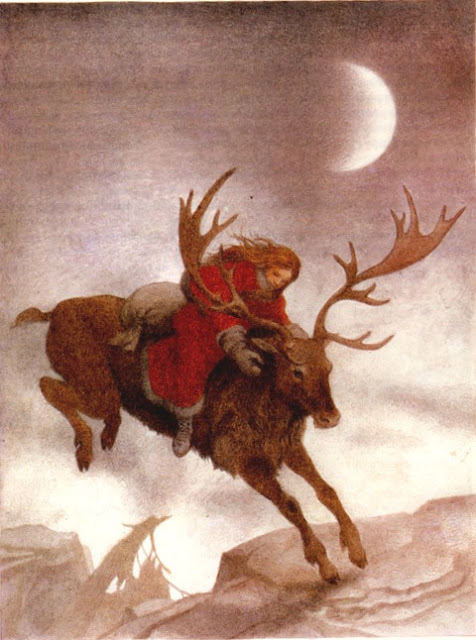 From women’s tapestries in Scandinavia to the red felt headdresses worn by the shamanic priestesses of the Altai in Siberia , to a burial ship found near Oslo in Norway laden with tapestries featuring antlered female figures wearing wearing red clothing, antlered female goddesses are a common motif – as are figures of the reindeer and deer. There is also great wealth of sacred and magical imagery surrounding the female reindeer and deer in Celtic mythology which often feature tales of white hinds (doe) which are associated with the goddess (who often gives birth to a sun child in the form of a white hind). Fairytales tell us she was ridden by the Snow Queen and peoples of the fairy world. And at this site discussing the antlered doe in Hungarian paganism there is reference to an old Christmas ballad which words are as follows: “Oh wondrous headed doe, with horns of a thousand branches and knobs. Thousand branches and knobs and of a thousand bright candles . Beivve was believed to bring the sun and fertility back to the land, making plants grow, so that the reindeer flourished and reproduced, and in this way she also brought wealth and prosperity to her people. So based on these sources (and I could go on!) it seems quite certain that there once an ancient deer mother goddess associated with the sun at winter solstice. It seems safe to assume that the reindeer pulling a flying sleigh at solstice or yule were female, and these reindeer were associated with northern mother or sun goddesses who dispensed good cheer and blessings (as in Saule who took to the sky in her sleigh led by a herd of reindeer). It also seems likely that northern female shamans wearing antlered headdresses took to shamanic flight on the longest, darkest night of the year, and that they believed it was the Deer Mother who gave birth to the new sun and carried the life-giving light of the new year in her horns. Today some of our most beloved modern Christmas iconography features antlered “stags”. Why does this image still speak so strongly to us? Could it be that they evoke an ancient memory? Are we remembering the long forgotten mother of winter solstice? I like to think so.